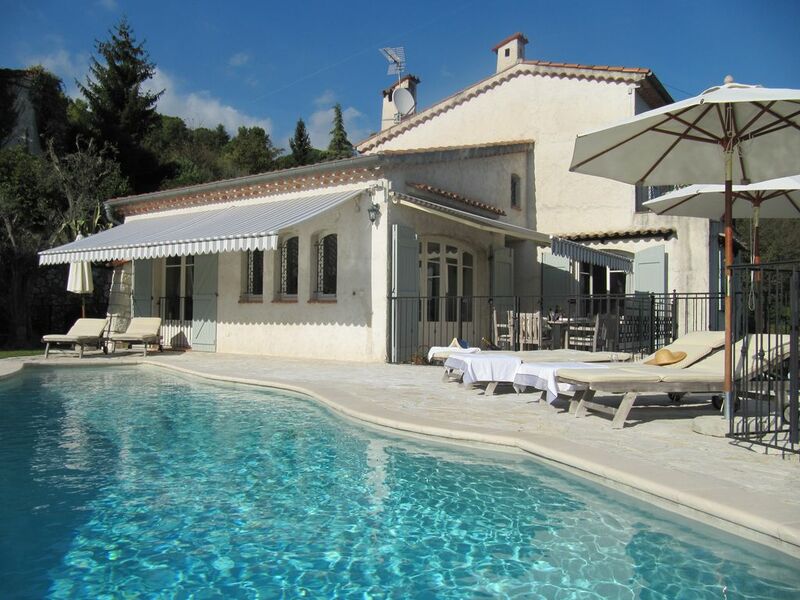 Le Cottage du Loup is a detached villa within its own gated grounds. There is parking within the property grounds for several cars Access to the salt water swimming pool (which can be lit at night) is just steps away from the living area with interior and exterior dining. Sun loungers and parasols overlook the south facing pool with views across a conservation area with a valley of pine forests where you can watch the sunrise and set with a good novel & a glass of rose. Sometimes you can be captivated by an eagle in flight across the thermals. The gardens are over 3 levels with numerous olive trees and mediterranean plants with shady areas to sit and read. Le Cottage du Loup sleeps 6 having the benefit of air conditioning in the bedrooms and main living areas and 2 kitchens. Light floods into the main living area with a double aspect opening onto the pool and exterior dining terrace.The main kitchen is modern in provencal style having a large range cooker with built in larder fridge/freezer and dishwasher and has all the equipment you need for your home from home. Double doors open up onto another terrace with outside dining table and seating with a range BBQ. The interiors with marble floors have been beautifully restored to create a romantic hideaway with crystal chandeliers and carefully chosen furnishings. There are 3 dbl bedrooms. 1 on the whole of the top floor with its own terrace and wonderful four poster bed with an adjoining bathroom and separate wc. A further spacious bedroom with a Queen size bed opens onto a terrace with a separate bathroom. The 3rd bedroom has an ensuite with a secondary lounge and fully fitted kitchen. Ideal for families with teenagers or groups of friends. Or if you require separate living space for a nanny. Just a short walk takes you down to the River Loup. A lovely walk whatever time of year, shaded and cool in Summer ideal for a picnic or wrap up in Autumn and Winter to watch the water racing down from the mountains. Facilities are available there for Kayaking and rock climbing. La Colle sur Loup is a delightful historic picturesque village with restaurants, cafes, butcher, bakers, patisseries, hairdressers, beautician (massages)grocers and a couple of small supermarkets. There is a small market in the centre on Saturdays. There is a great Tourist office in the village with very helpful staff. We do have a wealth of information at the villa of places to visit. There are large supermarkets within a 5 - 10 minutes drive together with the newly built Polygone Centre https://www.polygone-riviera.fr/ with around 95 stores and 27 restaurants and cinema..
St Paul de Vence is a famous walled village and only a 5 minute drive away is one of the most visited villages in France with many art galleries and its foundation Maeght is a must for art lovers. The beach at Cagnes is 4 miles away about a 10 min drive with its lovely new prom.The choice along the coast is vast. Golf courses and tennis nearby. A great area for cycling enthusiasts too. With plenty of watersports along the coast. Nice is only 15 mins, Antibes 20, Cannes 35, Monaco 40 or a train runs along the coast from Cagnes sur mer if you prefer a break from driving only 10 mins away with parking. If you have some time left there's an immense choice of shops and boutiques. There are two tennis clubs in the area. The first in la Colle sur Loup village a 3 minute drive or very walkable. There are 4 courts 1 clay and 3 synthetic managed by a small association. Anyone can book a court. The price is very reasonable. The second a bigger club in Vence approx 15 minute drive with approx 10 courts all in clay a club house and small restaurant. You can book a court as a non member. Our welcome lady will be happy to assist with information on the area prior to your visit.There is a welcome pack on arrival including a chilled wine, water, milk local produce,enough to get you started. Le Cottage du Loup is perfect for a romantic getaway, families with children over 7 or friends sharing. PLEASE READ ALL OUR GUEST REVIEWS FOR AN HONEST INSIGHT OF THEIR STAYS. english, french, A little Italian. We live in the UK with our two daughters.We fell in love with Le Cottage from the moment we walked up the gated drive. After purchasing in 2003 it then took us a further 5 years to renovate including the addition of a pool which overlooks a magnificent view down a conservation valley of pine trees. We wanted to create somewhere really special to go, full of beautiful things. Each time we arrive we all still feel excited and have had some wonderful times with family and friends. We now have regular guests who revisit each year and they also feel like its their home from home. We love the area with its diversity from historic towns, beautiful walled villages, mountains and having the sea close by. The way of life, food, wine and of course the sunshine. A big plus is it's great access to the airport only 15 mins away but being on the edge of the countryside. Nearest train station 10 mins, motorway 7 mins. Its close to Nice, Cannes, Antibes and only 40 mins to Monaco or over to Italy in just under an hour. It has great links to pretty much anywhere along the French Riviera . The area is so diverse being close to beaches, mountains, river walks and all amenities whether you want to play golf, tennis or visit one of the beautiful hill top villages like St Paul only a 5 minute drive away. There is so much to do and never enough time. Although it is close for accessibility it is tucked away for when you just want to relax away from it all. As a family there are so many things we love about Le Cottage du Loup. Its a wonderful place to wake up everyday. You can while away the hours just relaxing by the salt water pool admiring the view. Don't take our word for it have a read of our guests reviews Its close proximity to everything is just perfect whilst still feeling away from it all. Its great being near La Colle Sur Loup as you have all you need in the village and an open market on Saturday mornings. Many of our guests intend on visiting so many places but say once they arrive they stock up on food and wine and spend most of their days by the pool, cooking alfresco on the range BBQ. Or go for a stroll down to the River Loup. Saint-Paul de Vence is only a 5 minute drive away and has long been a haven of the famous. During the 1960s, it was frequented by French actors Yves Montand, Simone Signoret and Lino Ventura, and poet Jacques Prévert. We have a wonderful team who look after our guests. Our House manager who speaks several languages including English is on hand should you need advice for restaurants or information on the local area. When you stay at Le Cottage du Loup you can be assured that our support team keep everything ship shape and our House Manager will be there to deal with any issues should they arise. We hope you have a wonderful stay. Bathroom 1 has a Victorian style ball and claw slipper bath perfect by candlelight. Marble topped wash hand basin in provencal unit with large gilt mirror over. Heated towel rail. The toilet is in a separate room opposite. Bathroom 2 has twin sinks in a double marble topped unit. There is also a shower over the bath and a bidet. The toilet is in a separate room to the bathroom. Shower room to Bedroom 3 with great chrome dome shower, wash hand basin w.c and bidet. Marble floors to all bathrooms with towels provided for bathing and additional towels for swimming or sunbathing but please bring your own beach towels. Air conditioning is included but please do keep the doors and windows closed when using it. Heating is by radiator in the winter months from November to March. Ample parking within the villa for 3/4 cars but plenty of space outside the property for additional guests if required. There are 2 kitchens fully equiped. There are dining areas internally and externally for up to 8 people. There are 3 seperate exterior dining areas for between 4 and 8 people. There are 2 stereo/radio players one in each living room and an I Pod docking station in the main living room. There are magazines and many fictional books at the villa. There are some board games at the villa. The garden is over several levels with various palm, Olive and pine trees with a variety of mediterranean plants. The balcony to the upper bedroom with views across the valley has a table and 2 chairs. The river Loup is 5 mins walk down the road from the villa and has a Kayak Centre. Rock climbing is also in the Canyon by the River. There are various terraces around the villa for outside dining choices whether you prefer sun or shade. There are 2 tennis clubs in the area. One a 3 minute drive managed by a local association www.clubfft.fr/spoc.tennis or a bigger one Cayrons in Vence 15 min drive with clubhouse. Please ask for info. Smoking is OK outside but not in the villa pls. The pool 8m x 4m x 3.35m is graduated with a sitting area and overlooks the conservation area. The views are wonderful. To enable instant booking and show your full rental price housekeeping/cleaning is included but it is payable at the villa. We refund it after your second payment so you pay it on arrival at the villa. Please see notes. You will be greeted by our welcome lady who can help with any questions on the area. She can also arrange for any shopping if required as an additional service prior to your arrival. Had a great vacation the house was as expected very comfortable everything functional working well and kept very very clean we had a great experience well done!! Thank you so much for taking the time to write a review. We are glad you enjoyed your stay. After a long 12 hour drive it was a pleasure to be welcomed in to Le Cottage by the ever efficient Michelle . An excellent welcome pack and a chilled bottle of Rose certainly helped as well. The Cottage ( a villa really) was in tip top condition and everything for a stress free stay had been provided. The pool was heaven and the children spent many a happy day immersed in the lovely saltwater pool. Its good to hear you enjoyed your stay. It is a long drive from the UK and perhaps next time fly in as you can be in the villa within 4 hours from taking off with a chilled glass of Rose and some local produce to save you going shopping on your first day. We chose a saltwater pool as its much kinder to your skin and we should probably mention it more as a benefit as often travellers don't realise. Lovely, comfortable and clean home, beautiful view of nature and a refreshing pool to return to ! Excelllent property for a family vacation, clean and comfortable, traveling with three young adults appreciated everyone having a bit of space...kitchen well supplied for eating dinner poolside, Carmela and Michele are both very responsive to questions and suggestions..
Quiet neighborhood and the view make us feel like we were in a beautiful forest..loved the location! Leanne its really good to hear that you and your family had a good stay and that you found Michele helpful all feedback is appreciated. We always feel like we are miles from anywhere looking over the conservation area and yet only 5 minutes to all amenities. Having 2 separate kitchens and living areas is a big plus giving everyone space if they want to relax or watch a separate TV in their own space. We had a wonderful week. The only bad point about the house is that we enjoyed it SO much , we didn’t want to leave it to go exploring the area! As it was so hot, and the pool such a wonderful attraction, we spent nearly all our time at the house. As each day passed, we used the different areas; breakfast on the terrace, lunch at the dining table with doors wide open to the view, and occasional barbecues on the kitchen patio. All beautiful. The home has a very special "feel" to it, with wonderful decor, and we have made some very special family memories here. The kitchen is equipped really well and the air conditioning was very much appreciated at this time of year. Supermarkets are close by and it is not far to the beaches if you do decide to leave the house! I would like to think we will return on some future holiday. We are happy to hear you all had a wonderful time. So many of our visitors intend to do so much and like yourselves end up staying at the villa as we often do when we visit. We as a family really love our time there and have wonderful memories too. It is a special place and we have tried to make it special for our guests as holidays are so important to us all. We look forward to welcoming you all back and perhaps you may venture out to explore the area as there is just so much to see and do. A perfect tranquil hideaway ! We got a great surprise when we turned in the gateway of Le Cottage du Loup this July. The house has a beautiful authentic aspect and faces out over an expansive woodland view. It is beautifully decorated with three spacious bedrooms and a large cosy living room . We loved opening up the double doors from our bedroom and the big doors to the living room and letting the light flood in . The children loved having their own apartment downstairs and also spent hours in the pool . The pool is secluded and totally private to just the Cottage . It is also completely enclosed and secure. We used the big barbecue most evenings and alternated our dining between the two large outside tables. Listening to the crickets whilst having a glass of wine at sundown at Le Cottage du Loup was just wonderful after a busy day touring around . Michèle was lovely and couldn’t do enough to make our stay special . Carmela , you’ve done a wonderful job in creating a special place which exudes tranquility and atmosphere . With the pace of life we all live now I think we all look forward to our holidays and time together. Its really good to know that you all have had a lovely time. We all need a little bit of paradise! that's how our family feels whenever we visit and we are happy to share that with you. A bientot O Neills !! A month in Paradise ! My husband and I spent the entire month of June at Le Cottage sur Loup. It more than exceeded our expectations. Our goal was to explore la Cote D’Azur and take day trips to as many places in the area as we could while having a cozy place to come back to at night. Friends joined us at the beginning of the trip. The villa was perfect. From the time I started to plan the trip over a year ago to the end of our trip Carmela was on top of communications and very helpful. Michele welcomed us at the villa, showed us around, gave us tips about the area and answered questions as we had them along the way. Maria did a great job keeping the place clean every week and even brought us flowers from her garden and homemade cookies! We really enjoyed coming back to the pool every day to relax and deal with the warm weather. The kitchen is very well equipped. We made very good use on the new BBQ when we did not go out for dinner. The two main rooms on the main level and upstairs are very comfortable and each having their own bathrooms is very handy when you have two couples. We did not need to use the suite downstairs. There is a very nice breeze throughout the house when you open the windows. We had to use the air conditioning for the last 3 weeks as it got very warm and we were in moskito season so had to close up at night. Having the air was a nice feature. The setting is very pleasant as you oversee the mountains in the surrounding area. There is no ocean view but there is also a lot of privacy. We felt comfortable and safe in the area. The location is good as you’re away for the busy towns . It is very quiet. With a 15 to 20 minutes drive you can easily get to the beached and the sea. There are a lot of shops and restaurants within easy driving distance. You can’t really walk to go for dinner. You definitely need to rent a car! I would highly recommend the villa! Thanks Carmela for sharing your piece of Paradise! It is always such a pleasure to have such lovely guests and we are happy to share our little bit of paradise. Its always good to get feed back as the team behind the scenes who have been with us for a long time all work hard to make every ones stay enjoyable and we also appreciate everything they do. I will certainly pass your comments on to them. Le Cottage Du Loup is a couple of minutes from La Colle Sur Loup Village with restaurants, cafes, bakers, butcher, supermarket and a short stroll down to the River Loup for a lovely tree lined walk along the river bank with kayaking and rock climbing . St Paul De Vence the 2nd most visited village in France is only a 5 min drive with the world renowned Colombe D'or Restaurant visited by many celebrities and some of the finest art galleries in the country including Foundation Maeght. Other picturesque villages close by include Vence, Tourrettes Sur Loup, Mougin, Grasse, Biot. With easy access all along the coast whether to Monaco and the Grand Prix , Antibes and its yachts, Cannes for the music and film festivals, Nice for its wonderful market in Cours Saleya. Italy, St. Tropez.. In Winter skiing is approx 50 mins to Greolieres or slightly further to Isola 2000. Golf nearby in Villeneuve Loubet and tennis courts in the village and Vence. Golf: The nearest golf course is at Villeneuve Loubet 5.3 kms from the villa. It has a Club house and Pro shop and has 9 holes. However there are 13 golf clubs within easy reach for information please go to www.en.leadingcourses.com then click on France then type in La Colle sur loup it will bring them all up with all the info on them. Or get in touch with us by email if we can help further. Ski: The nearest ski resorts are Isola 2000, Valberg, Auron, Greolieres. There is also a ski bus which departs from Nice, Cannes and Antibes but for up to date information log onto www.allaboutnice.com then link onto ski from Nice. Cleaning/Laundry/Linen is included in the price but payable at the villa. To allow instant booking we include it so you know the price in full. We then refund it upon receipt of the second payment. The costs we refund are below if you have any questions please just send us an enquiry. Thank you 1 week stay 333 euros 2 week stay 506 euro 3 week stay 679 euros, 4 week stay 852 euros From 1st June to 31st August we only book full weeks Saturday to Saturday. Please do make an enquiry as sometimes we can facilitate a part week.